The data science curriculum at the University of Rochester culminates in the semester-long capstone course. It complements the more structured and traditional course work that students take earlier in their program. 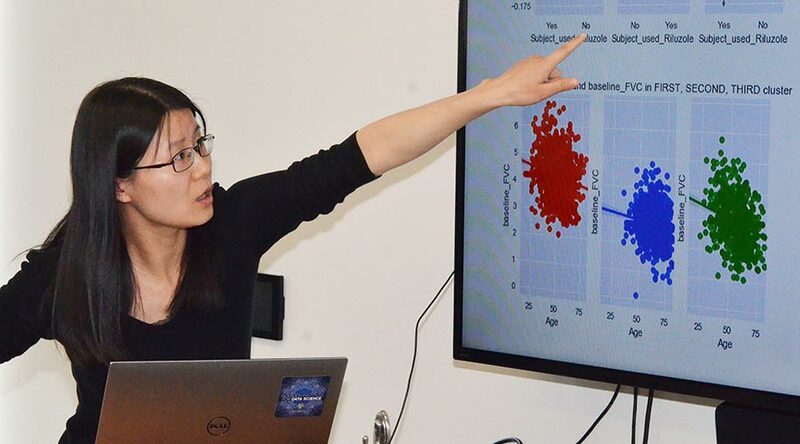 The data science curriculum offered at the graduate (MS) and undergraduate (BA/BS) level at the University of Rochester prepares students for the challenging task of deriving insights from vast quantities of structured and unstructured data in a variety of disciplines. At the core of the curriculum are the capstone and practicum courses for undergraduate and graduate students respectively. These two semester-long courses emphasize a team-based learning experience that gives students the opportunity to conduct real-world analytics projects using data provided by sponsoring organizations. Since the program was launched in 2016, more than 15 projects from seven companies have been offered to students spanning a broad range of industry segments including consumer retail, healthcare, agriculture, government and finance. Students will then work in teams of three to four members over an eight to ten week period (one semester) to understand the business problem, clean and analyze the data, and devise a solution. During the project, the students are strongly encouraged to establish and maintain regular communication with an assigned contact from the sponsoring entity. Day-to-day progress on the project is tracked by university faculty assigned to the course. At the end of the project, students are expected to give a presentation and executive summary of their findings to the sponsor. Capstone and practicum course students have successfully completed a rigorous set of upper-level undergraduate or graduate level coursework in computational statistics, data mining, machine learning and computational tools in data science. Interested in sponsoring a team project for an upcoming semester? Our students are ready to help you solve a challenging business problem using data analysis. There is no sponsorship fee or funding required. All you need to provide is a challenging business problem and data for analysis. This data cannot include personally identifiable information (PII), and must be shared in a manner that is consistent with your third-party data transfer governance rules. Many of our previous sponsors have successfully anonymized business sensitive information in the data sets and the problem description, while still maintaining the necessary technical information required for the students to execute the project. We understand there are time and effort commitments for commercial entities to sponsor a student project, and we are very grateful to them for engaging on such initiatives with us. Well defined problem statement that can be articulated in one or two concise paragraphs. A data set that can be accessed by the students, either as a flat file (e.g., CSV) or via remote access to the sponsor’s database/data warehouse using software tools that are available to the students. Requires statistical analysis or machine learning techniques to solve (e.g., predictive modeling, data mining, knowledge discovery, statistical correlations, visualizations). Requires some level of exploratory analysis. Requires some level of data wrangling/munging. Can be done primarily using programming languages like: R, Python, and Java. A business or technical contact at the sponsor institution who can communicate with the student teams during the project. For more information about sponsoring a capstone/practicum course, please contact Ajay Anand or Adam Tulgan. We will be glad to work with you in further defining your proposal.